"With over 300 species of mammals, South Africa boosts of ample bird and other wildlife watching opportunities. Different topographies and climates offer a variety of fauna to explore in the open savannahs as you bask in the luxury of our handpicked resorts." A journey to South Africa, experiencing fascinating cultures and viewing diverse bird and animal life, without any doubt affords an opportunity of a lifetime to any photographer. A carefully planned itinerary, will provide ample visual moments to add to your camera skills and come back with stunning images. A typical photo day commences early in the morning, with midday rests and resumes early in the afternoon. This not only provides for sufficient rest but utilises the best light and avoids the tourist crowds as well. Starting from the staggering splendour of Cape Town, this city will provide you with the perfect start to hone your photographic skills, and strengthen your portfolio with pictures for the sterner tests ahead. Cape Point, Table Mountain, Kirstenbosch, african penguins, Addo Elephant National Park etc. will prepare you for that once in a lifetime picture, which you will be aspiring for on the African safari to Kruger which follows. The Kruger national park trips are all carefully planned and researched to allow you the best possible opportunity to experience and photograph the amazing wildlife spectacles you are bound to come across. With your passion and enthusiasm, along with our expert guidance, you will make the most out of this enthralling trip. Regardless of whether you are just entering into the wonderful world of photography or have been clicking for years, the South African photo journey will be ideal for you. Day 1 – Arrive into Cape Town (also known as the Mother City) where you will be met by a representative. You will be escorted to the hotel wherein after settling down you will head towards Kirstenbosch National Botanical Gardens http://www.sanbi.org/gardens/kirstenbosch . Kirstenbosch is adjacent to the famous Table Mountain National Park and together they form part of the Cape Floristic Region Protected Area. This region was proclaimed as a UNESCO World Heritage Site in 2004. One of best sunset on the Table Mountain can be viewed from Bloubergstrand (Blue Mountain Beach) which is right across the bay. Dinner would be served at the hotel following a short interactive session among all the guests. A good nights’ sleep is highly recommended as there’s a long day ahead. Day 2 – After breakfast, a short drive to Hout Bay to visit World of Birds through the picturesque Chapman’s Peak drive. A tour around Cape Peninsula, where baboons can be seen in their natural habitat, will take us to Cape Point, where the Indian and Atlantic Oceans meet. You will head around the coast to Simons Town and on to Boulders Bay where we will visit the penguin ‘Honeymoon Hotel’, a protected breeding ground for African Penguins. African Penguins are the only penguins to be found on the continent and there are few places that offer as remarkable a viewing point as Boulders Beach. Some of the best pictures of African Penguins can be clicked here alongside the beautiful landscape. For lunch, you will head to Victoria & Alfred Waterfront following which you will have some time to wander around the waterfront and have a look at the seals there. The afternoon would be perfect for a visit to Two Ocean Aquarium in V&A Waterfront where marine life from both Indian Ocean & Atlantic Ocean can be seen. Some exquisite life forms such as translucent jellyfish, the rare Knysna seahorse and giant spider crabs. All these beautiful marine life can be seen through the exhibit which is a 10 meter long glass tunnel. For sunset, you will be whisked to Oudekraal where you will have ample photo opportunities and also interact with other guests. Dinner would be served at a restaurant (TBD) in Llundudno. After dinner you will head to hotel to relax and get ready for the next day of adventures. Day 3 – Morning starts with early breakfast after which you fly from Cape Town to Addo National Elephant Park which houses over 600 elephants along with lions, buffaloes, rhinos, spotted hyenas, leopards, variety of antelopes and zebras, etc. The unique Addo flightless dung beetle is not found anywhere else in the world. After lunch, a game drive would be the ideal scenario for rest of the day. 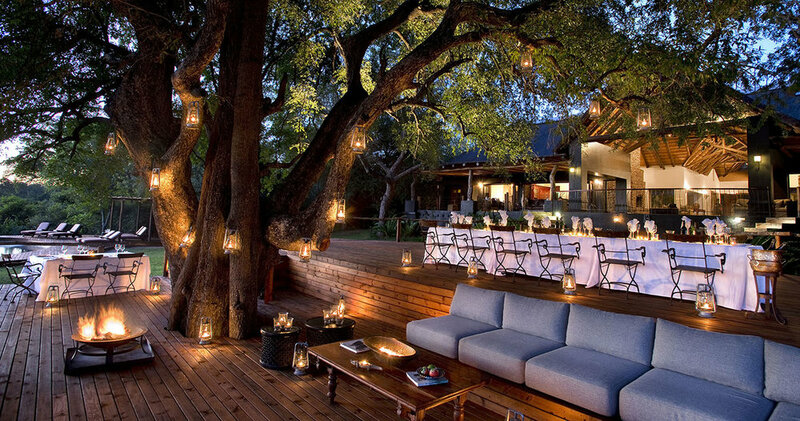 Sunset in the bush with some sun downers would make this an experience to remember. For dinner, you head to your hotel and then relax. Evening is at leisure. Day 4 – Continuing your stay at Addo, you will head out for early morning and sunset game drives which will give you almost 8 hours of photo opportunities for that perfect picture. Breakfast and dinner would be at the hotel. However lunch would be served either in a restaurant or within the game reserves. A session among the guests in the evening would be ideal so that everyone can share their experiences being the last night in Addo as you head out to Kruger National Park next. Day 5 – After breakfast, you fly to Kruger National Park. For this you will fly to Johannesburg and then take a small plane ride to our exclusive luxury private game reserve for real African Safari experience. All meals, game drives, safaris would be perfectly timed for you along with photography sessions and discussions. Day 6&7 – Stay in Kruger National Park. Day 8 – After morning drive, breakfast would be served at the hotel. Following which you will take a small plane ride back to Johannesburg from where you will take a flight back home along with the wonderful memories and photographs to remember them by. I love to travel, and the most intriguing of the 100 countries I have visited during 30 years of international travel are those places with a culture most different from my birthplace in Australia. I travel to learn more about the beauty of the world and the diversity of its people as I see travel as an intellectual pursuit. Through my photography, Social Media (using the name “The Travel Camel”), speeches and radio appearances, I seek to inspire others to explore the world for themselves and to take the road less travelled. Need help planning your next trip, or have questions? SET UP 1-1 MEETING WITH US.